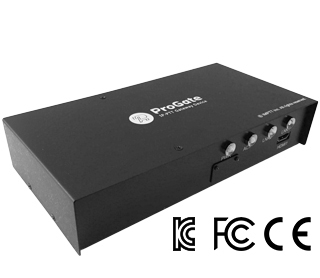 ProGate is a IP-PTT Gateway device that provides you voice PTT communication environment between IP based Push-To-Talk service and two-way radios(FRS, UHF, VHF, TRS). It supports Peer-to-Peer mode and IP-PBX device connection for the connections radio to radio or radio to phone. ProGate supports optimal communication mode depending on site conditions. ※ For connections above, you need a ProGate Cable suitable for the radio. ProPTT2 provide software based firmware which optimized for the production of IP-PTT Gateway. With this G/W device, you can connect IP based Push-To-Talk service and two-way radio you have. We provide ProPTT2 SDK, guides, and sample programs for your own client applications on ProPTT2 developers website.